What is the Military Order of Devil Dogs? We are the Fun and Honor Society of the Marine Corps League. Unlike some other organizations, all members of the Military Order of the Devil Dogs are created equal. 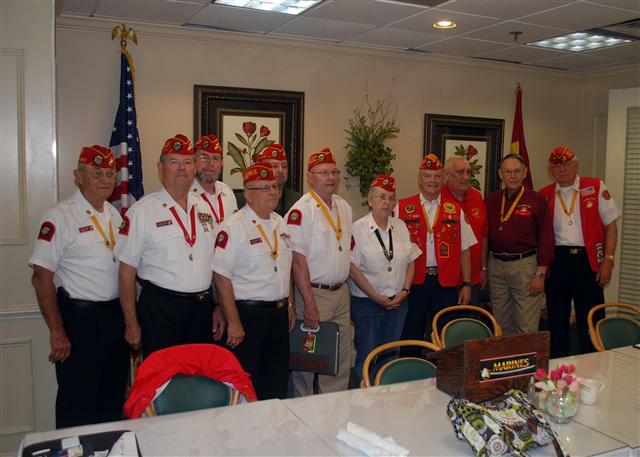 Only Regulars members in good standing in the Marine Corps League, with one continuous year may be “asked” to apply for membership. The success of the Pound is up to its membership and especially up to its leadership. The Kennel and the Pack will help, but they will not do the work for the Pound nor can they guarantee its success. NOTE: Items on this page are from the MODD Handbook. 2006 Edition. I am an American, I was born in France. I hold the title of United States Marine, and understand the commitment of holding the title, Devil Dog. It is a tradition born at Belleau Wood in the year 1918, of a force in readiness and the “First to Fight.” As a Devil Dog, I ask no quarter and give no quarter. I will do everything in my power to uphold the objectives of the Military Order of Devil Dogs and to carry out my duties to a swift and satisfactory completion. You must be a paid-up member for one year and in good standing in the Marine Corps League, Inc. The applicant must be active in his or her Detachment in the League, and must be invited to join the Order. He or she must be recommended by his or her Detachment Commandant and be sponsored by two DEVIL DOGS or PEDIGREED DEVIL DOGS. The applicant is then interviewed by the members of the Pound at a Pound Growl. (A meeting is called a Growl.) If accepted, the applicant must undergo an initiation and obligation ceremony. Then he or she becomes a Pup in the order.